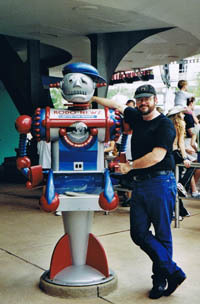 <!- NOTE: PAGE 53 -Pictures of me and robots, leading into robot toys-- subtitled bradandbots.html-> Brad W. Foster and Robots: Is this a healthy hobby or a twisted fixation? I really don't understand it myself. I had lots of toys as a kid. All kinds. I liked making buildings with my Kenners Construction Set. But, while I went on to get a degree in architecture, that didn't stick. I had various train sets, but aside from counting the cars as they crawl past when I'm stuck at a railroad crossing, I didn't pursue that any further. I had buckets full of green plastic toy soldiers, but aside from staging a formal hanging ceremony off a stack of building blocks, a military career didn't take over my life. But robots? That stuck. I remember my Mr. Machine, my Robot Commando, my Yakkity Yob. 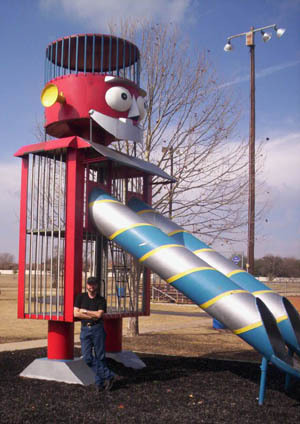 (And, up until a few months ago, I thought Yakkity was just a weird dream of my youth that I had made real in my mind. But Yakkity exists, he exists! And someday, he will be mine again!) I remember being allowed to stay up late to see "Forbidden Planet" (thanks Dave!) and Robbie the Robot being the coolest thing I had ever seen. Of putting up with endless silly plots on "Lost in Space" to watch the lights blink in the dome of "Robot", my new best friend, if only I could get rid of that pesky kid who always hung around him. I have no mechanical skills at all. I'm the kind of person who, if my car stops running, I take the advice to "check the engine" quite literally. I open the hood, and if the engine is actually still in residence there, that's as far as "check the engine" goes for me. So possibly it is the total lack of knowledge that has me fascinated with robots. On the other hand, it could simply be they are just so gosh-darn cool! My first attempt at doing my own big-time comic was, of course, all about robots. The Mechthings ran for four issues, though I had (and still have on hand) plans for dozens of issues. One thing doing that comic did for me was to make my realize just how many little toy robots I had "accumulated" in my adult life. Without any conscious effort that I was "collecting", I seemed to just pick up a toy here, a toy there. They were all over my apartment. When I started to gather them all together in one spot for a publicity shot for the comic, I was amazed to see how many I had obtained without really noticing it.